These brilliant women and their collaborators put together a remarkable film full of imagery and hopefulness. The word Inspiration quite frankly feels like an understatement….. this is a visual dialogue on just how many of us have walked in these shoes worldwide, and what we are left with when we look at it in these terms, is stunning. The Sacred Project film is now a part of history and I am moved beyond words at the finished film. It speaks volumes. Please watch and SHARE this project with your world, because its one of the most simple and loving ways we can influence change. My deepest heartfelt thank you to everyone involved for bringing this to life. 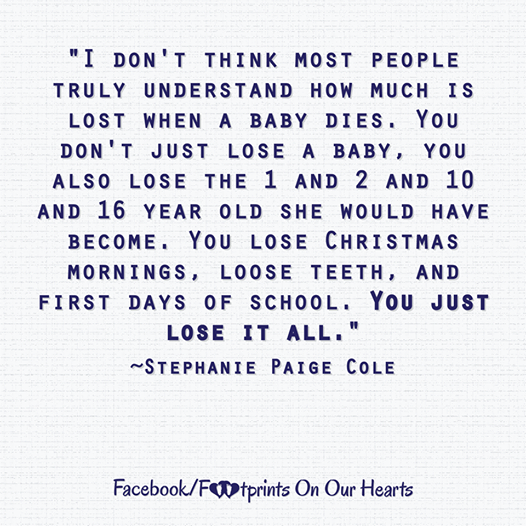 My heart sighs at just how truly profound and un-ending our losses as parents are when a child dies. Sometimes I’m able to ignore dwelling on the nagging empty space that my heart holds for D. When I allow my mind to wander, its these types of things that I grow angry about. I know we’re suppose to be happy about the fact that we got to spend any time at all with our little wonders (if we had the chance), but that doesn’t negate the fact that we have still all lost these opportunities to watch our children grown and experience the world and the wonders of life. It’s never singular; we continue to lose, over and over again. I saw this quote today and it really struck me. There have been many times where I’ve felt lost, but never as much as after the death of our daughter. There is something about the way these words are laid out to take on so many different meanings that makes it worth putting out there to think about. Here’s my interpretation: It’s shockingly reminiscent of the journey that we take through loss/grief. At first it seems like we’re in denial…. ‘I’m not lost…’ I just don’t know where I’m going yet…. Then the journey becomes a search for healing “I’m trying to find somewhere I’ll like”. Once we’ve found that place of healing we’ll stay there (one might call that acceptance), and then the final line: “I’m not lost. I’m on my way” is the turn around of coming out of the grief and starting to rebuild their world. In another interpretation, one may look at this simply as a positive re-framing of perspective. When you find that you are at peace with being “lost”, you then aren’t lost anymore, because there is no longer a need for a specific destination. So changing your own view is a way to move forward and stop feeling so stuck. I struggle with this in life. A planner by nature I like to have a plan and I like to see the road ahead of me on how to get to the destination. That’s not to say that I always have a rigid unadjustable view, but I do want a general road-map (in sticking with the driving metaphors …) I want to know where I’m going and how to get there. In my head, I’ve figured out the directions. Obviously when detours come along it really messes me up because I’m type A like that. Going back to the words in this quote, when detours are thrown at you, and you begin to look at it that you’re on your way to the place you’ll like, it’s a lot less ominous. Even when you don’t know how to get there, and sometimes that is the best way to take the journey. How would you interpret these words? All footprints start small, some are born as small as a wedding ring. From the precious beginnings of that first breath of life, a premature baby will open your heart to miracles of life…..
Trust in their determination and in time, their footprint may be larger than yours…..